Tension is mounting at Anyinam in the Atiwa district of the Eastern region after four bodies were found near a mining pit at Akyem Akukuso. 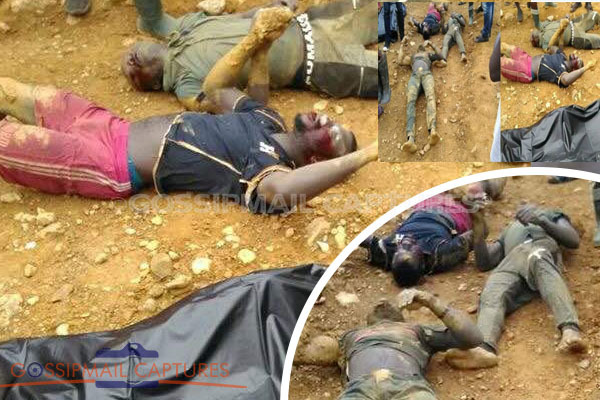 Residents there claim the four, who are three drivers and a mate, were killed by members of the anti galamsey taskforce, Operation Vanguard. Leader of the drivers, Kwasi Nyarko has said that the four were hired to a mining site at Akyem Akukuso to tow away some mining equipment last night but did not return.He indicated that a search operation was subsequently carried out and the bodies of the deceased were found in a shallow river. Mr. Nyarko is convinced the four were beaten by Operation Vanguard because they detected bruises, cuts, and mark of assaults on their bodies. Meanwhile, some angry illegal miners in Anyinam and Kwarbeng allegedly prevented Kwabeng Police from conveying the bodies to Kibi government hospital. It took the intervention of the Member of Parliament for the area, Hon. Kwasi Amoako Atta before the police were able to convey the bodies to the morgue. But the Public Relations officer of government’s taskforce on illegal mining Major Garibah Paddy has denied news making rounds on social media. He said the team has not been to the town in question and therefore cannot be held responsible.